A few years ago, the owner of Munupi Wilderness Lodge, joined my Masterclass coaching program, wanting to improve his marketing and attract more $1,000 a day clients. Munipi Wilderness Lodge was situated on Melville Island, a 20 minute light plane trip from Darwin at the top of Australia. The Lodge’s target audience was predominantly AB demographic males, doctors, lawyers and wealthy business owners. These guys were not frightened to pay around $1,000 a day for the privilege of experiencing some of the most exciting fishing in the world. Indeed, this area was known as “Barramundi Heaven” and fishing enthusiasts around the world had a visit on their bucket list. “Munupi” is an aboriginal term, with the Lodge’s name being influenced by the indigenous population of Melville Island. Lodge owner, Michael Benton, invited me to visit the Lodge for a “reconnaissance mission”, during which time I was able to get a better understanding of the resort and its target audience. On the weekend I visited the Lodge, I was fortunate enough to meet and interview a businessmen’s group of a dozen or so guys who frequented the location twice a year. In speaking with these men, it was clear they all came from a wealthy career path, careers including plastic surgery, film production, doctors, developers and lawyers. And when interviewing them, it was clear that they were all there not just the fishing, but the adventure of a boys’ weekend. Upon getting back behind my desk, I provided the owner with my suggested marketing plan, including a bold “rebranding” move of renaming the resort to Clearwater Island Lodge. The resort’s occupancy rate needed lifting, so owner, Michael Benton, was receptive to my ideas and agreed to rename the resort Clearwater Island Lodge. My rationale was that the Aboriginal term “Munupi” really meant nothing to the majority of the Lodge’s target audience – and I believed a more adventurous name would conjure the right images in the minds of our target audience. The Lodge owner told me that he had a limited marketing budget and hence, I understood that we needed to get as much “free publicity” as we could. The Lodge’s website was uninspiring and bland, so I convinced the owner that he needed to rejuvenate the site. And of course, with a new name, the Lodge’s website needed a complete overhaul in any case. Because the Lodge was home to “Indiana Jones wannabes,” I designed a site which had “adventure” written all over it! If the doctors, lawyers and developers were looking for an exciting fishing expedition, we had to make the website look appropriately adventurous. Also, if we were going to stimulate free publicity, it was important that the first port of call (ie: the website) communicated the right ambience to journalists and prospective guests. Hence I created a website that had the appropriate ambience. 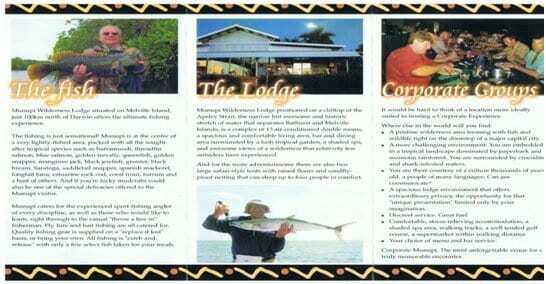 We were also able to feature some famous celebrities on the refurbished website, as the likes of Andrew Ettinghausen and Rex Hunt (famous TV fisherman) had been guests at the Lodge when filming their respective TV programs in north Australia. Both raved about the Lodge and its barramundi filled estuaries. I knew that in order to excite journalists of relevant magazines, we needed to also produce appropriately themed collateral that communicated the unique adventurous aspects of this fishing Lodge. Mind you, it had been voted as one of the Top 5 fishing spots in the world a couple of years earlier! 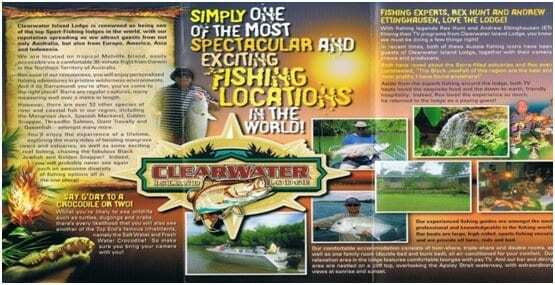 Having produced the appropriate brochures, I put forward promotional proposals to numerous fishing publications and offered prizes of “weekend getaways” in return for editorial exposure. I scored a 75% hit-rate with the specialist fishing publications and therefore the newly named resort was enjoying significant free publicity in magazines which reached their primary target audience of keen fishermen. Keep in mind that we had ensured that we had all our “ducks in a row” before we solicited publicity support from the media. The resort’s name had been changed, the website completely overhauled to project the right adventurous image and the collateral was appropriately themed to attract rich businessmen who thought they were Crocodile Dundee! I also prepared a Media Release which was forwarded to not only outdoor and fishing publications, but also to business magazines such as the Business Review Weekly and Newsweek. The media release also went to all major newspapers which had significant readership numbers of our target audience. weekend prize was an easy thing for the Lodge to do and didn’t cost very much. So even if there was considerable wastage on radio, it was still worth doing, as the giveaway prize was not costing the Lodge a lot. I also produced a number of press advertisements which were given to publications who joined the Lodge for a promotion. It was a concentrated 6-month promotional program and the results were stunning. I had to delay a targeted direct mail campaign (to a “fishing enthusiasts” database we rented) because the Lodge was quickly running at 100% occupancy for a number of months. A lot of the publicity that was gained was certainly helped by the fact that the Lodge could boast famous guests who were happy to provide testimonials. When you explain that fishing icons like Rex Hunt and Andrew Ettinghausen rave about the place, any journalist interested in travel or the outdoors is going to listen to what you have to say. This is just another hint for you. If you have any celebrity or well-known sports star who has purchased your product or used your service, make sure you feature this in any media releases or publicity that you distribute. 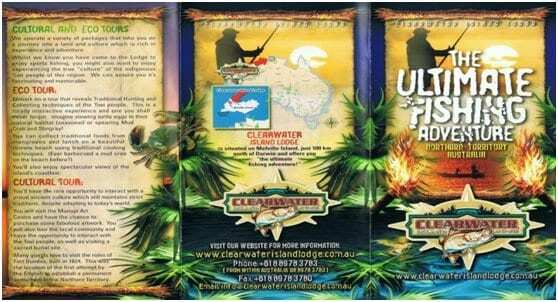 Just as Andrew Ettinghausen and Rex Hunt provided instant credibility to Clearwater Island Lodge, a well-known personality could do the same for you. I ‘m not talking about asking them to endorse your product or services, but rather I’m simply saying that if you have had a famous client, don’t be shy about telling people about it. Even better if you can score a photograph or two with them, so that can be used for publicity! When it comes to gaining free exposure, remember that it’s a numbers game. The more promotional proposals and media releases you send out, the greater chance of scoring more publicity.